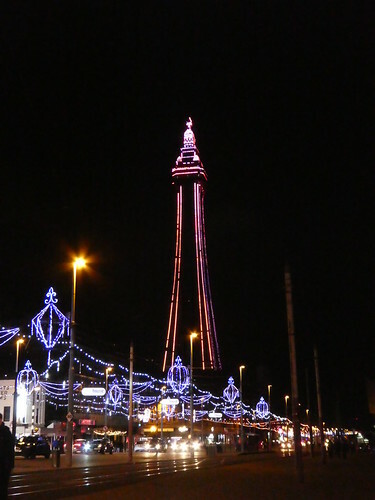 The Blackpool Illuminations is an annual lights festival which was founded in 1879. 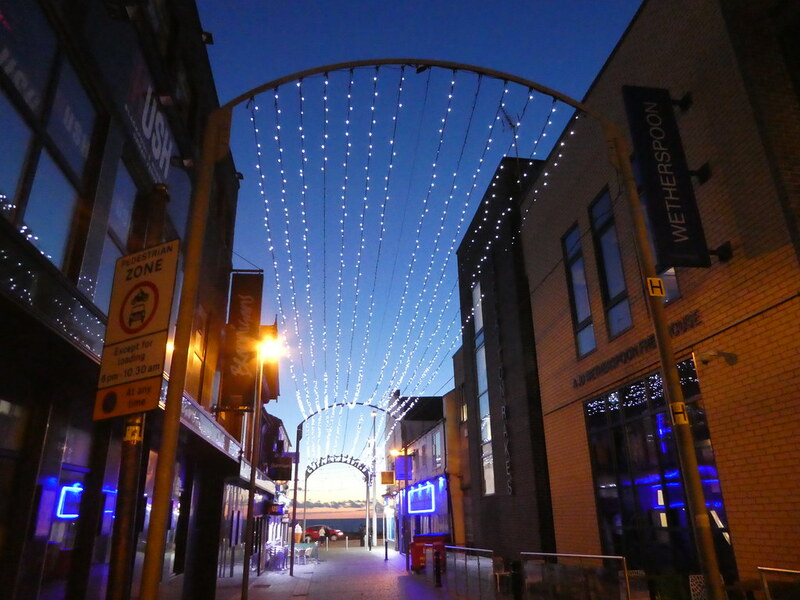 It started life with garlands of 10,000 coloured light bulbs strung along the seafront and was such a huge success that it continued as an annual event extending the tourist season by an extra two months. 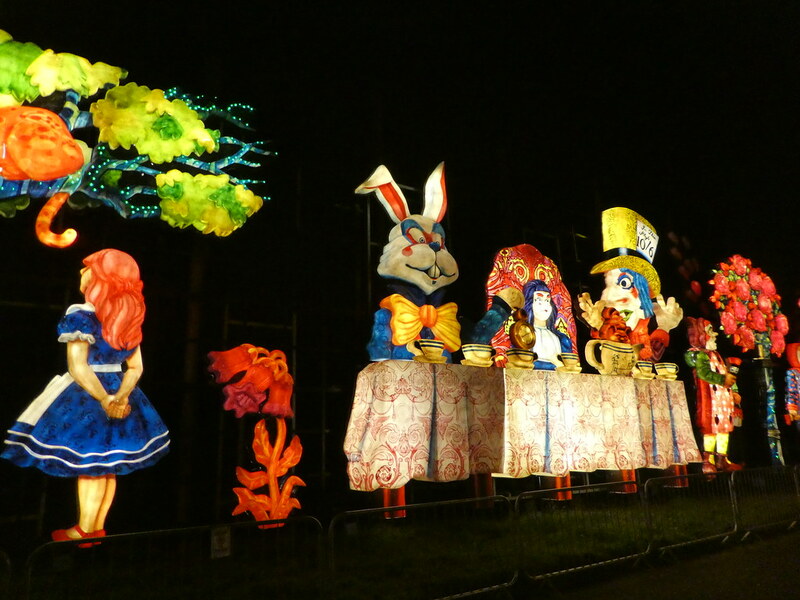 The Illuminations or ‘The Lights’ as they are often referred to run from late August to early November each year. The Lights extend for 6 miles (10 km) and contain more than one million light bulbs. Each year on the opening night ‘The Big Switch On’ takes place with a live concert and a celebrity is invited to perform the switch on. This year, for the first time, instead of a celebrity the illuminations were switched on by Star Trek with intergalactic help from a huge laser beam. The switch on takes places on the Tower headland and it is so popular that around 100,000 people apply for the 20,000 tickets available. The annual cost of staging the illuminations is £1.9m and although free to view, donation boxes are placed at each end of the promenade for voluntary contributions to help defray costs. 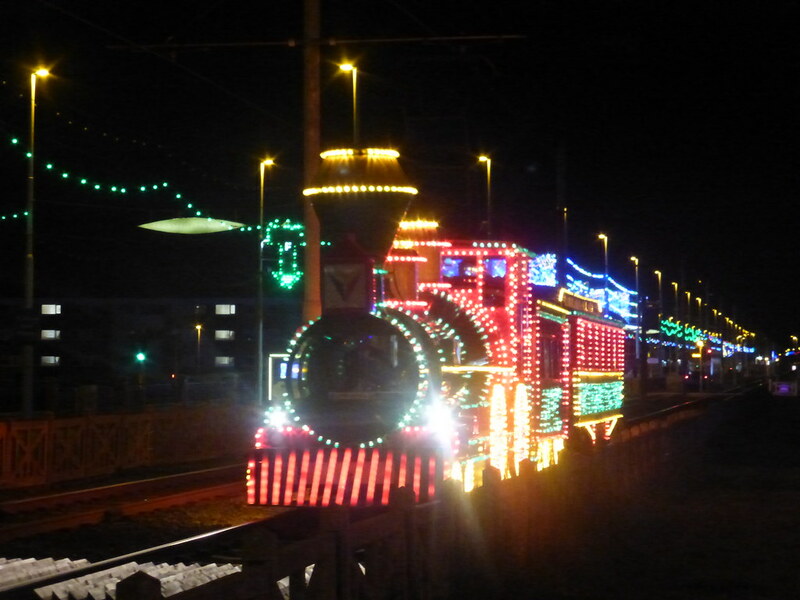 Most visitors drive slowly through the illuminations by car or coach but viewing the extravaganza on board a tram is also popular especially on one of the three illuminated trams which are shaped to resemble a train, a boat and a rocket. It takes 22 weeks to assemble the lights and to check that they are all working and then a further 9 weeks to dismantle them at the end of the festival. We ate dinner early so that we had plenty of time to view the illuminations. Following our afternoon trip up the tower we noticed a poster offering ticket holders a return evening visit for an additional £3. This offer seemed irresistible and so we returned at 8.00 p.m. to view the twinkling lights from the top of the Tower. It was very quiet and we were able to ascend the lift without any delays. I’m so pleased we were able to appreciate the views both day and night. We even climbed up to the outer viewing area once more but it was quite windy up there so we didn’t linger very long. 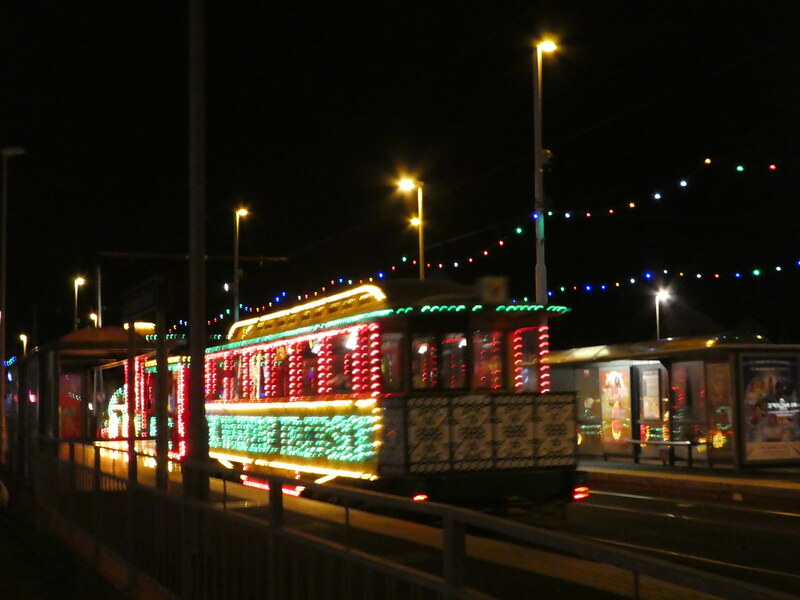 After leaving the Tower we strolled along the promenade as far south as Central Pier before boarding a northbound tram to Bispham which lies at one end of the illuminations. 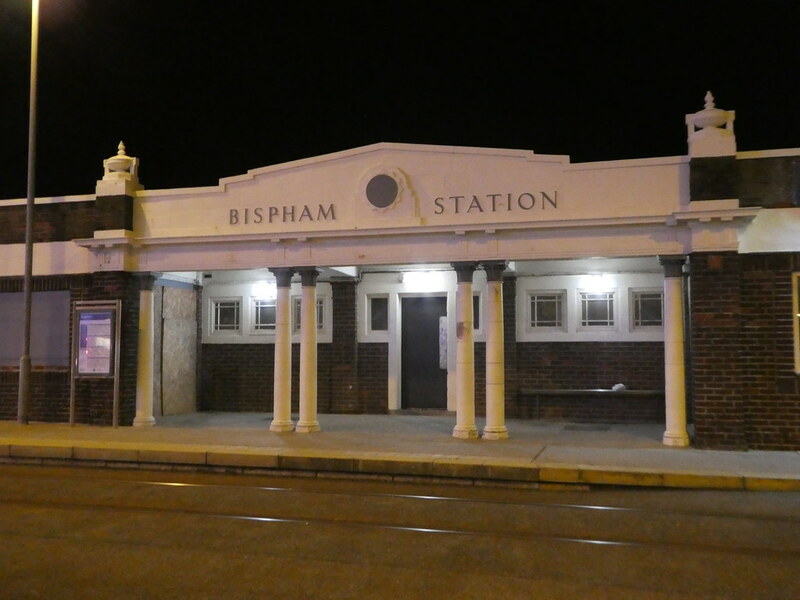 Bispham tram station was built in 1932 and has a facade of columns and urns. It used to contain a ticket hall and provide shelter for waiting passengers but is now closed and is only in use as a tram stop. Recently Blackpool Civic Trust submitted plans to re-open the heritage station as a cafe so hopefully this will happen soon and bring the building back into use. Along the cliff tops from Bispham to North Shore the displays comprise 40 large tableaux. A path runs alongside the tableaux which are set back from the promenade beyond the tram track making it easy to view them. It was fun strolling past the various tableaux and watching the lighting effects. The Egyptian tableau was very impressive as the sarcophagus opens to reveal a mummified secret. In addition, to the side of the tableau a large mummy pops up to give onlookers a scare. Moving along we observed a wide variety of tableaux ranging from nursery rhyme characters to television favourites. I particularly liked the Mad Hatter’s Tea Party with Alice in Wonderland, featured above. On reaching the end of the tableaux displays we caught a tram back to the North Pier and returned to our hotel after a fun filled day at the seaside in Blackpool. Reblogged this on Golden Sands Blackpool. Thank you so much for your kind words. Reading comments like these gives me lots of confidence to continue my writing. Will do. I’m just making a cup of tea so I’ll settle down with your blog in a few minutes. 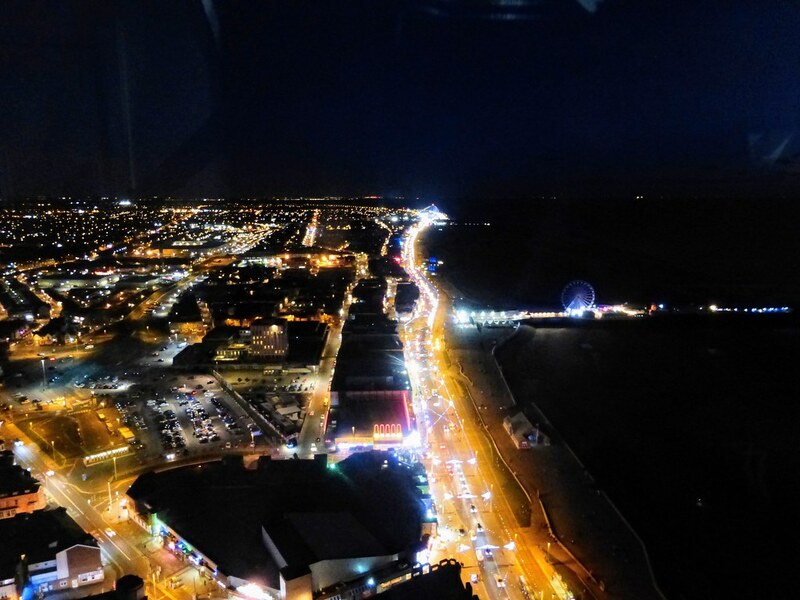 What fabulous views from the tower at night and for only a little extra! The tableaux look amazing. It is easy to see why the Illuminations are so popular. Thanks for sharing. 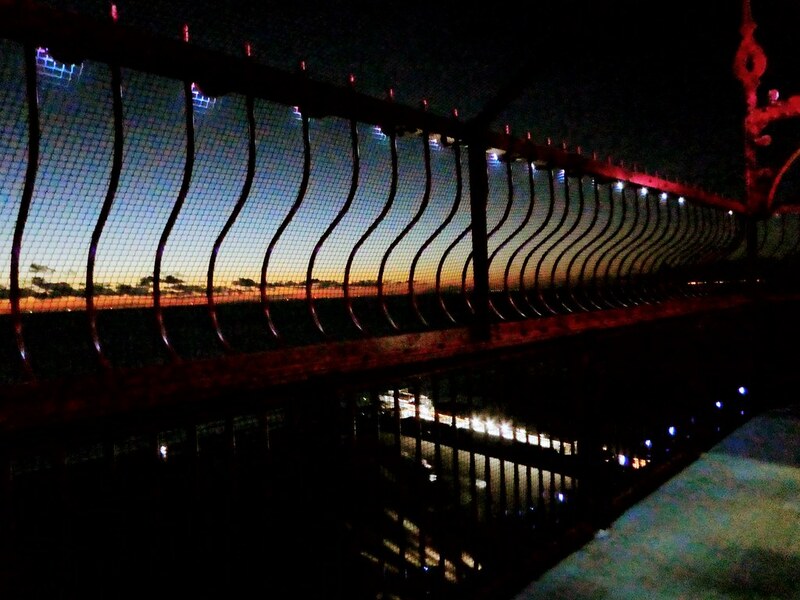 It was great to be able to go up the tower both during the day and at night. I’m pleased you enjoyed this series of posts. I was brought up near there but hadn’t been back for some time so it was interesting to see how it had changed. Thanks for your much appreciated comments. Glad you enjoyed it Sue. Thank you for taking the time to comment. 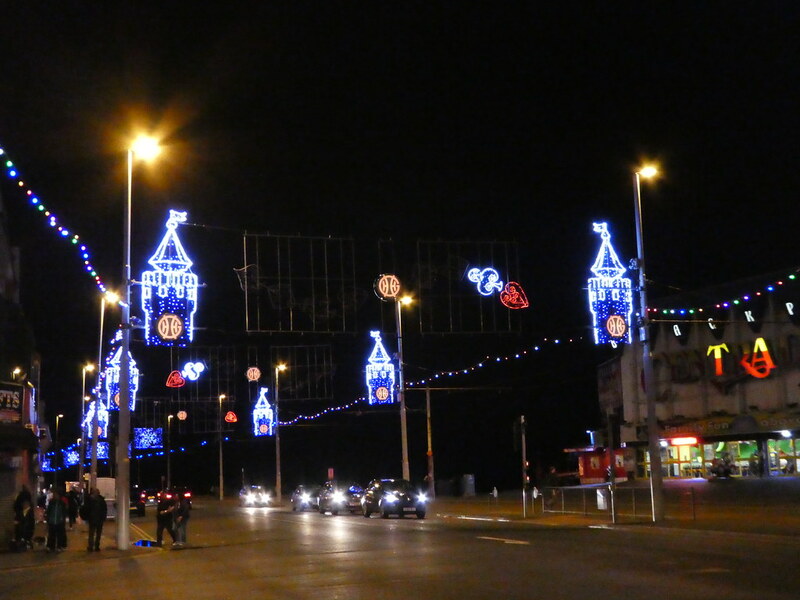 Thanks Jason for your interesting thoughts on my Blackpool Illuminations post. I’m pleased that my post brought back some happy memories for you. How interesting. Would love to visit Chiang Mai sometime. Fabulous photos Marion. Great information. When we lived in Wales and even here in Australia my dad used to say ‘turn the lights off; what is this Blackpool’. Ha ha. I love it! What a great way to remember Blackpool. Hope you’re having a good weekend. Takes me back to when we visited the illuminations as a kid. We used to go on a coach for a day trip each year. 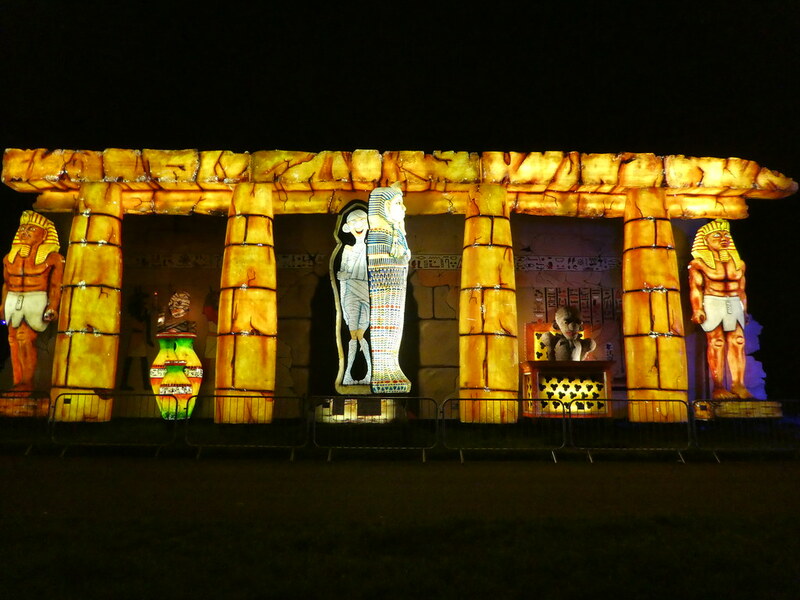 It’s good to read that my post on the Illuminations brought back some fond childhood memories. Thanks for getting in touch. Thanks Marcus! Glad you enjoyed the Blackpool Illuminations. Hope you have a great weekend on you photography masterclass in Berlin. I’d love to see that!! Hopefully you can take your boys when they are a little bit older! Thank you for your kind words. I’m glad you enjoyed this post. This really changes my opinion of Blackpool! It’s great that they have an event that battles the grey British weather. The tableaux look wonderfull and so creative! Thanks for sharing this lovely post! Thank you for your kind words. It’s good to read that you enjoyed this post on the Illuminations brightening up the longer, dark evenings in the town. Thank you for your kind words. The Blackpool Illuminations are definitely amazing and unlike anywhere else. mostly my travel consists of going up and down the steps of the town house.I can see most things online.I must say you have taken some stunning pictures. Thank you for your kind words. I’m pleased you are enjoying my blog. I remember being taken up to Blackpool as a child to see the Illuminations – it looks just as good these days as it did then! I love the illuminated trams; we only ever crawled along the promenade in the car. Hi Rosie, When our children were small we also crawled along in the car and needless to say the boys had fallen asleep before we had got to the end! The illuminated trams are lovely, I remember going on the Rocket many years ago. Yes, I was there in September and this Illuminations is spectacular. Thank you for post and bringing back very fond memories. I’m so pleased you also got to see the Illuminations this year Terry. They are indeed spectacular. Your pictures are superb Marion – gorgeous night shots. We haven’t been to the Illuminations for a few years now, but we used to make a point of going when our son was younger. We were caught a couple of times in horrendous traffic jams and started taking the tram which is a great way to see it all. I love the views from the Tower – only been up there during the day but this is definitely something we would enjoy. Thank you Joy. It was an absolute bonus being able to return up the Tower in the evening as we hadn’t heard about it before. I know what you mean about the traffic jams – when our sons were small we took them through the Illuminations several times and more often than not they had fallen asleep before they had seem them all!! Really interesting post, I love the Mad Hatter photo! Thank you so much for your kind words. The illuminated tableaux were beautiful. Thank you. My old camera was like that too, but my LUMIX is better at night but sometimes it still looks slightly blurred if I jerk the shutter as I’m taking the shot. That is so pretty and sounds like an awful lot of work for those who set it up and take it down. Looks like it is worth it for those who get to see it. Thank you, it’s great to see but it takes a lot of time and effort, especially when it’s windy and they have to do maintenance. I should go back to see more – esp. the stunning view from the tower! Definitely try the view from the tower one day, it’s well worth a trip. Love the Mad Hatter’s Tea Party! I loved that too. Unfortunately I couldn’t get it all in the photo as if I’d stood further back I would have been on the tram track! Thank you. It’s great to visit the illuminations at least once to experience them. They used to have Illuminations in Morecambe, too, and we often had arguments about who put on the better show. Years we couldn’t afford to go, we’d go to Grange over Sands instead, and see the Morecambe lights from there. My cousin and I still sometimes argue about whether we cold see the Blackpool Illuminations from there, too. We sometimes went to see the Morecambe lights but I always thought they were much smaller but still nice. Very nice. I heart about the backpool illuminations before but I didn’t realise that it was huge. I will try to go next year. That’s great. They are definitely worth a visit, I’m certain you will enjoy them. Thank you Ingrid. I’m pleased to read that you enjoyed my post on the Blackpool Illuminations. Thank you. The illuminations are an amazing sight to see.